At CHA I was gifted with the sets of these minispinners – holy cow so CUTE! Art Impressions has had full-size spinners for interactive cards for a long time. I haven’t had a ton of success with them since the hole in the card has to be so huge – kinda hard to make it a ‘stable” card that way! But….these minis? They stole my lil heart – especially the squirrel! But I do show you the rest of the spinners at the end of the video too. 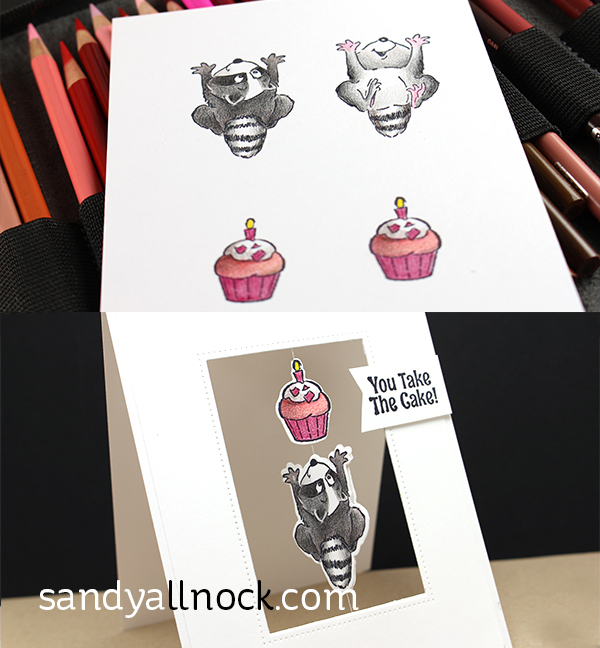 Raccoon – kitty – my other faves! Watch the video below or click HERE to see it in HD on YouTube. These are so adorable and I’d like to do everyone of them but…I don’t have the stamps and there is an investment in money, time and space in getting more stamps. I would love to have more things like these in digil stamps and you’re such a talented artist. 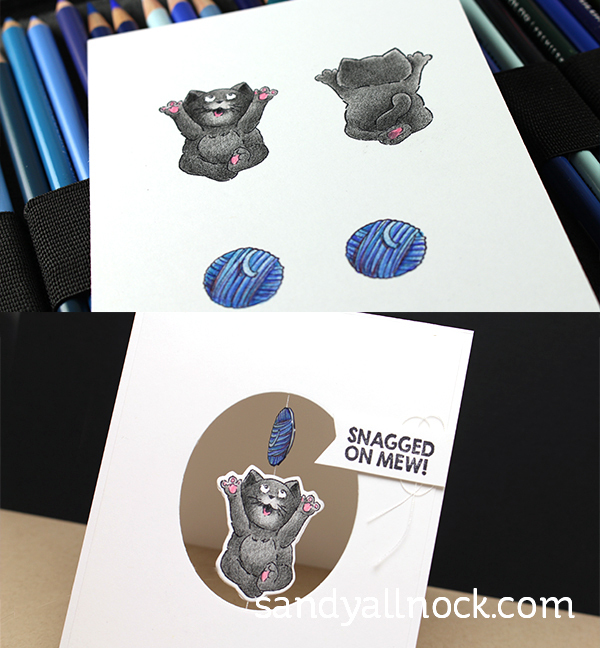 I have your set of digi stamps and I love working with them. The plus is they can be increased or decreased for for different uses. Just a Thought. Really wish you would list the colors used….. I hope you can forgive me for occasionally not doing so. (Many never do.) It’s a huge amount of work I already provide for free. Dang Sandy – 13 posts all at once! You going to be gone for a while????? you mentioned a pencil sharpener….but I do not see the brand mentioned here…. These are AWESOME, Sandy! Love the fun characters, and the punny sentiments! Thank you! I bought a spinner set and haven’t gotten around to using it because I wasn’t sure how to assemble. You’re the best! I clicked on the link to the colored pencils and it took me to a prisma pencil sharpener. I looked on Amazon and there’s two types of prisma colored pencils. Verathin and soft core. Wasn’t sure which ones to get. Sorry, I must have put in the wrong link! Try this one: http://salln.net/1L3l5kr The Verithin are okay, but are thin – which means you get a lot less pigment for the money. You rock! I am PATIENTLY (not really) waiting for your copic class. I cannot wait!!!! 🙂 I’m all signed up and put in my requests at EH. Hope they get them before the class. These are so sweet Sandy! 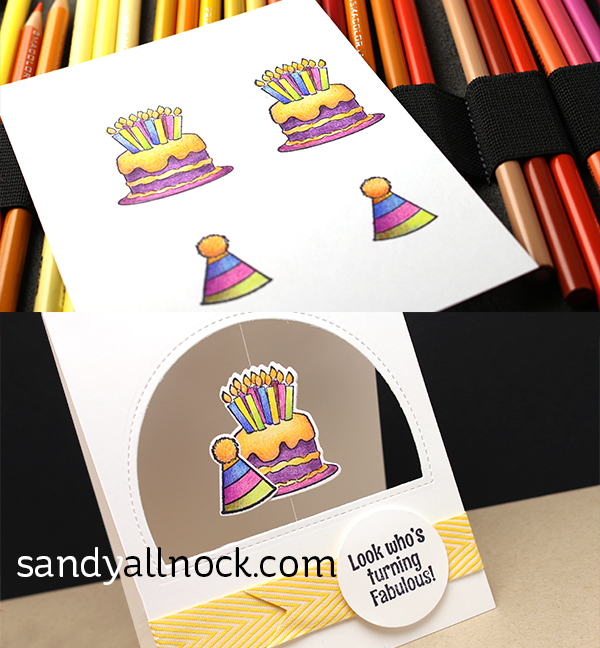 I haven’t made a spinner card in a loooonngg time! 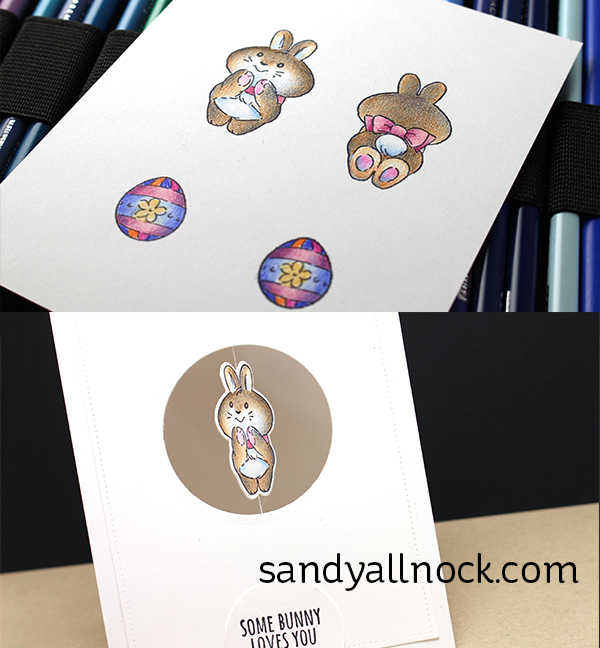 I have just recently started buying Art Impression stamps and I LOVE them. I must find THIS set! TFS! Does the pencils come in a set of all the colors? I would love to have them. Great video. 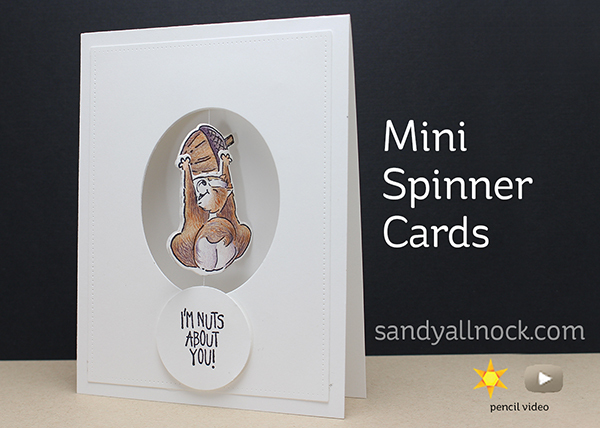 Love these spinner cards especially the raccoon…so cute! Wow…so cute. I need to look to the cat since I make cards for our local animal shelter.